There's been a lot of response to my last blog post about mobile photography projects so here's another batch of them. I had specified projects in the UK and Ireland but can't resist including these from the US in the 19th century because I think would should have at least one photo-boat. Part of a collection on Luminous Lint that Helen Trompeteler had spotted. Going back even further, on Facebook Taco Hidde Bakker posted a link to this speculative research on Palaeolithic camera obscuras by Matt Gatton. They were mobile and in Ireland and the UK (possibly) a long time ago. And also nicely resemble the work of the Pinhole Pedallers who cycled around the South West of England towing a tent obscura. Here they are pictured at Lacock Abbey, which I imagine is to contemporary mobile photography projects, what Stonehenge or Newgrange were to their Palaeolithic predecessors (that's just speculation on my part obviously). 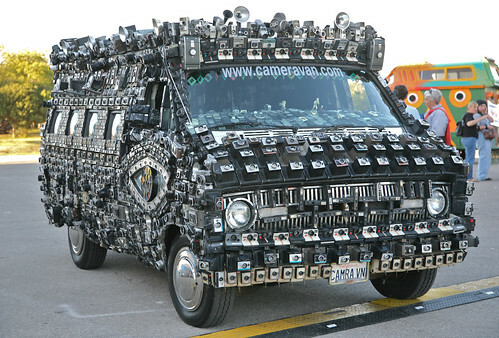 Daniel Meadows also made reference to the Cameravan, a custom van encrusted with cameras made by Harrod Blank. This is based in the US but visited the UK for Photo98. I'm breaking my rules about what is included now, but Ángel from Photoireland mentioned the Cameratruck which claims to be the world's largest mobile camera. And while we are talking about large cameras Peter Neill posted this picture of his Hunter Penrose process camera. When asked in what way it is 'mobile' he replies helpfully 'Well, it comes with a 15 foot railway track. It could go on a trailer'. Tomorrow we can hear from someone who actually operates a mobile photography project. This entry was posted in Archives, Lists, Technology and tagged camera obscura, cameratruck, mobile cameras, Palaeolithic camera obscura, photovan, pinhole pedallers. Bookmark the permalink.